PCie SSDs are all the rage right? Storage is always a major part of the thinking process when undertaking any new PC build. Do you need more space or do you need better performance? While I can’t answer that for you, what I can say is the performance of drives, especially SSD’s is getting better and better while the prices on them are coming down and hitting all-time lows. It is also estimated that in 2016, SSD capacities should severely increase and the prices drop even further, putting them on a GB/Price comparable to a normal hard drive. If this is the case, be ready for companies to try and get even more competitive while still maintaining a level of innovation that offers great performance. If you’ve been living under a rock for the past few years, or, you are just getting into PC’s, the advantages of having an SSD over a normal hard drive is the speed it can transfer data at. Not only can SSD’s offer blazing fast speeds, they are also more reliable as they have no moving parts. SSD’s are great for everything from decreasing computer boot up times, using them as cache drives to speed up internet browsing and they can even help load up your favourite programs and games quicker. If you as me, there is absolutely no reason why everyone should not have at least one SSD in their system these days, even if it is only used for storing the operating system. Today, I will be taking a look at a more non-standard SSD by way of the Plextor M6e Black Edition. The M6e is a PCIe x4 based SSD that allows it to utilize faster speeds via PCIe lanes, rather than standard SATA connections. The M6e actually consists of an M.2 SSD that is mounted on a PCIe adapter so even those without M.2 slots on their motherboards can make use of the even faster speeds. The M6e BK offers read speeds of up to 770 MB/s across all size variants with write speeds of up to 625MB/s for the 512GB version, 580MB/s for the 256GB and 335MB/s for the 128GB version. All in all, it looks pretty impressive on papers, so let’s see what it is really made of! All in all, it looks pretty impressive on papers, so let’s see what it is really made of! The packaging for the M6e Black Edition covers all the areas one could hope for. 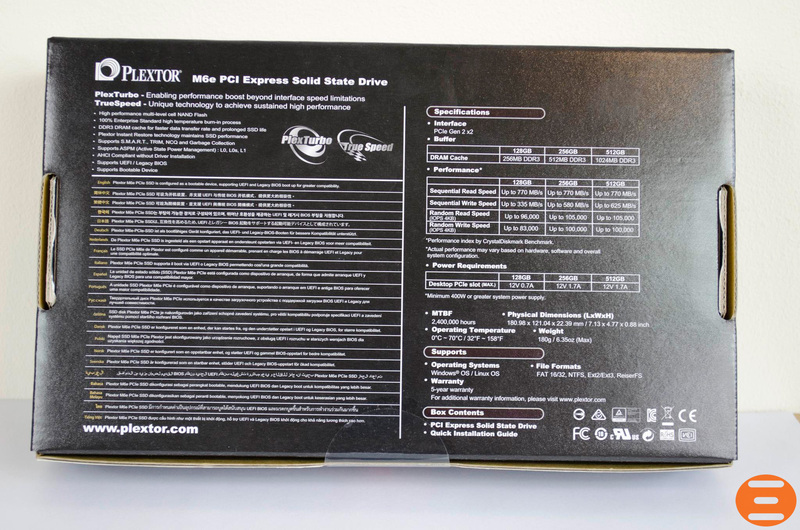 The front of the box lets us know for sure we have a Plextor M6e Black Edition SSD in 256GB and it also lets us know a couple of more important features it has to offer. Moving around to the back of the box and here we can see all the specifications for the various models. Users should be able to look at this information and get a firm idea of whether or not this SSD will be compatible with their SSD and also if it will live up to their needs. 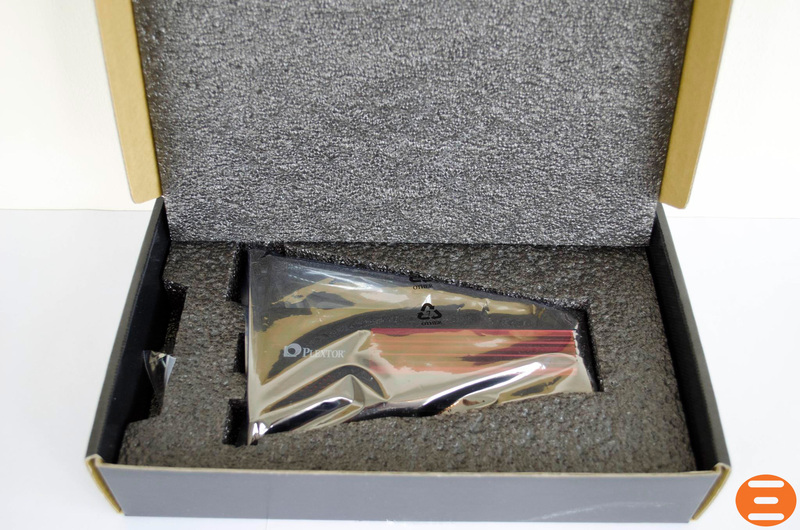 Opening the box and the M6e BK is safely packaged inside an anti-static bag which is also surrounded by nice foam padding to make sure the drive stays safe until it reaches your PC. 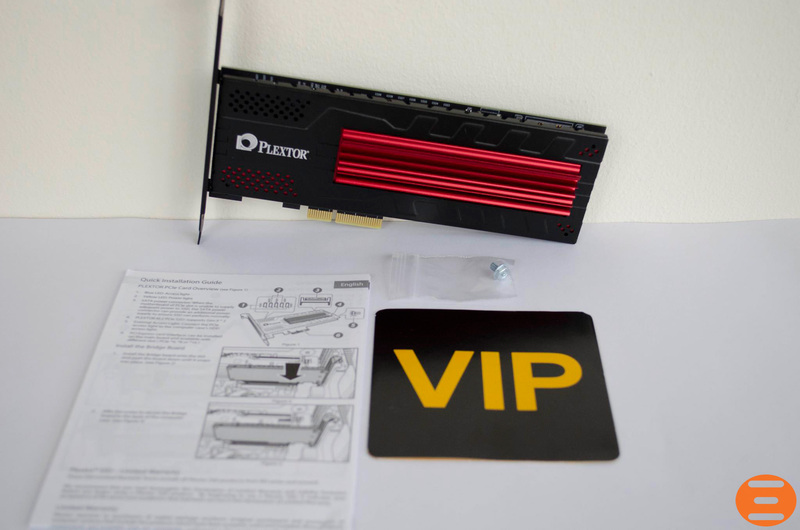 Aside from the SSD itself, there is also a screw so you can secure it to your case and the installation guide so in case you have any questions, you can get them answered quickly and get to utilize the amazing speeds of a PCIe SSD. Next articleThe Witcher 2: Assassins of Kings – Linear Perfection!